WOW! ***RARE 4 CAR GARAGE, Large .36 ACRE LOT with RV Gate, ***Fabulous Negative Edge Pool with JAW DROPPING 180 MOUNTAIN & CITY LIGHT VIEWS! ***You will LOVE this spacious 3BR, 2.5 Bath home with DEN, ***BRAND NEW PAINT INSIDE & OUT, wonderful ***GREAT ROOM FLOOR PLAN, beautiful tile flooring, ***BIG GOURMET KITCHEN with HIGH-END STAINLESS APPLIANCES, gas cooking, breakfast bar, GRANITE COUNTERS & backsplash with quality 36'' raised panel cabinets with some glass cabinets too! 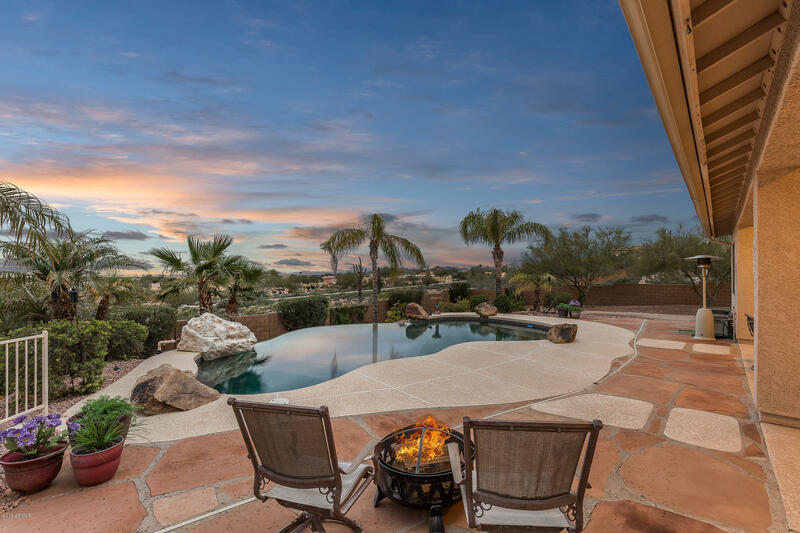 Enjoy entertaining or just relaxing from your beautiful, DEEP INFINITY, PEBBLETEC POOL, with water feature and flagstone EXPANDED PATIO AREA with multiple seating areas! All furniture and household items in home are included...and most decor too! DON'T WAIT TOO LONG...MUST SEE!